I-69 is beginning to take shape through Obion County and is attracting considerable attention among area residents. Overpasses for the interstate are rising around Union City and construction crews have cut off traffic to certain areas as they work on building up the interstate route around Union City. Most noticeably, overpasses are beginning to take shape on Brevard Road, just west of the Union City Goodyear plant, and a second intersection on West Main Street. Erwin White, I-69 project manager for northwest Tennessee, told The Messenger Monday that preliminary work is on schedule through this area for the interstate. In a telephone interview from his Jackson office, White said site preparation work is being done for the interstate project’s route through Obion County. He explained that Stage I construction work includes designing the structures (interchanges) and earthwork on the interstate. For the Union City area, there are actually five interchanges planned along the I-69 route. The first interchange will be at Mayberry Road northeast of Union City and just south of a proposed weigh station and rest area. Other proposed interchanges around Union City include one on State Route 21 (Jordan Highway) just north of Union City, the interchange on Brevard Road, an interchange on State Route 5 (West Main Street), an interchange on State Route 184 (East Old Troy Road just east of Belle Aire Subdivision), and a final interchange on West Reelfoot Avenue. Generally speaking, White said it costs about $6 million to $10 million per mile to build an interstate and interchanges cost an estimated $3 million to $5 million apiece to build. The biggest obstacle to completing the superhighway known as I-69 is money. That was the consensus among speakers at a Mid-Continent Highway Coalition (I-69) meeting last week at the Dyersburg/Dyer County Chamber of Commerce ... John Ford of Ford Construction and vice president of transportation for the Dyersburg/Dyer County Chamber of Commerce said the state is hurting when it comes to receiving federal funding for projects and especially for I-69 ... His company is working on a 4-mile section of I-69 in Obion County at the cost of $32 million. Ford said Ford Construction is just one of 25 projects in the country involved in completing I-69 and one of only five in the state ... He stated the state of Tennessee did not include any I-69 jobs in the northern part of the state in their three-year road plan ... "The only I-69 funding in the three-year road plan going forward is the paving of two sections they have already built in Shelby County, and then I think it's about 2.3 miles at the very bottom section," said Ford ... Ford added the work was continuing on right-of-ways and engineering in the state ... "A lot of that has already been funded," said Ford ... According to Ford, the Tennessee Department of Transportation lets contracts for around $700 million-$800 million, which is about 2 percent of federal transportation funding. Ford said there is a proposal to cut the state's funding by 35 percent, which would be a cut of $281 million ... "I'm just saying, from our perspective there needs to be a lot of conversation with the governor and the commissioner of transportation," said Ford ... He noted the need for money to be specifically designated for I-69 ... Congressman Stephen Fincher was at the meeting and said the country is at a financial crossroads and infrastructure needs more attention paid to it ... "We take our infrastructure for granted," said Fincher. "And until the American public one day goes out in their car and knocks the front end from under the car, because there are potholes in the road as big as this room, I'm afraid we are not going to deal with it." ... "I just cannot propose a gas tax in this environment," said Fincher ... Fincher stated he and his colleagues were fighting to get a highway bill out ... Mid-Continent Highway Coalition Vice President Bill Revell gave an overall report on the construction of I-69 ... The whole construction of I-69 is divided into 32 sections of independent utilities ... "The reason they did that is because if they can't complete the whole highway someday, whatever they do complete the money won't be thrown away," said Revell, giving a comparison of Great River Road off of I-155 ... He added I-69 is very important due to the trade partners to the north and south, meaning Canada and Mexico. "It's critical we get this highway built," said Revell. What exactly is the "Great River Road" off I-155 and why was it a waste? Probably SR 181, which seems to have been built to higher standards up to the abrupt end at SR 88. State Commissioner of Transportation John Schroer got a first-hand look Tuesday at progress being made on I-69 in Obion County. Schroer and about 30 other state and local officials stopped on top of the Brevard Road overpass as part of the TDOT Projects Tour 2011 ... Schroer told the group that work on the Obion County segment of I-69 represents the first “pure” segment of the new interstate under construction in Tennessee. Work on the I-69 route through Obion County is ahead of schedule, according to Erwin White with the TDOT office in Jackson. On Tuesday, Schroer stressed the importance of the interstate project for Tennessee as well as the entire country ... Work on the I-69 route through Obion County is being done in “segments.” Construction is ahead of schedule in Obion County as the interstate route is beginning to take shape around Union City. In fact, during Tuesday’s briefing on Brevard Road, several concrete mixer trucks rumbled by and drowned out some the comments made about I-69. “It is a priority of mine to see firsthand the investments we are making in transportation projects across the state,” Schroer said. “These ‘viewing tours’ will also give us the opportunity to share valuable information about these projects with our elected officials and engage the public along the way. Construction on Interstate-69 is now under way in the Union City/Obion County area and is expected to be completed next year, according to Bill Revell, Tennessee chairman (and vice-president) of the Interstate-69 Coalition. Shelby County is also currently making construction strides on its future I-69 Corridors. In Shelby County, I-269, a western, semi-circular subsection of I-69, encompasses former U.S. Highway 385. The future I-269 subsection on the corridor is almost completed between Millington and Collierville. According to Revell, it is expected to be fully constructed by 2013. The I-69 corridor will run west of U.S. Highway 51 and will be broken into three sections. It will then join Interstate-240, also a Future I-69 Corridor, and will run directly through Memphis, merging into Interstate-55 at Hernando, Mississippi. The route then runs east to Tunica, Mississippi. This particular section of I-69, running from Hernando to Tunica, is complete. In Shelby County, I-269, a western, semi-circular subsection of I-69, encompasses former U.S. Highway 385. That describes a whole lot of fail right there. That's by far not the only fail in the article. From Millington to Dyersburg, Tennessee in Shelby, Tipton, Lauderdale, and Dyer Counties. 2nd Qtr: The Environmental Consultant submits the Final EIS to TDOT for review and approval. 3rd Qtr: TDOT submits the Final EIS to Federal Highway Administration for review and approval. 4th Qtr: Receive approval on the Final EIS from the Federal Highway Administration. The completion date for the final EIS is in the process of being adjusted to reflect the completion of additional technical studies along the north end of the corridor near Dyersburg. In the second quarter of 2010, a property owner claimed in a letter to the Environmental Protection Agency (EPA) that the corridor for I-69, SIU 8, would cross a landfill located in the north end near Dyersburg. The information was passed on to us to investigate. In the third quarter of 2010 we partnered with the Tennessee Department of Environment and Conservation on completing an Environmental Site Assessment of the area in questioned. The information given to us indicated the potential landfill site would have been in operation in the early 1970's. This was before any permit or reporting was required so the likely hood of finding any records on the landfill was slim to none. The study was completed in the first quarter of 2011 and revealed the area was used for a landfill and the soil is not suitable for the construction of a highway . Our next step was to look at moving the alignment far enough within the study area to avoid crossing the landfill area. In the second quarter of 2011 it was determined that a shift in the alignment approximately 500 ft. east would avoid the landfill. Now we are in the process of completing technical studies for the line shift and incorporating the results into the FEDS. First quarter of 2012, the FEDS will be completed and submitted to TDOT for approval. Second quarter of 2012, the FEDS will be submitted to FHWA for approval. Third quarter of 2012, the record of decision signed. - I-155 currently ends at US 412 east in Dyersburg. However, the freeway continues along US 51 north through the remainder of Dyer County into Obion County, complete with a speed limit of 70. This makes me wonder if I-155 was indeed supposed to be part of something bigger, like a routing of I-24 which was discussed in another thread. - At Troy, TN, the freeway quickly ends and the speed limit drops accordingly as you transition onto a four-lane divided arterial. - Between Troy, TN and Union City, TN US 51 remains a four-lane divided highway with at-grade intersections. A typical TN four-lane setup here. - At Union City there is a bypass for US 51, but the bypass has a speed limit of 55 mph with at-grade intersections. I don't know where the construction for I-69 was in this area; I suspect it was a few miles to the north of the bypass from what I could tell. I didn't have time to investigate to see where the construction was. - NE of Union City, US 51 resumes as a 70 mph freeway at it's interchange with TN 22 east. This setup ends just short of US 45E where what I suspect is Old US 51 (TN 214, Ken-Tenn Hwy) rejoins the alignment. It split off at Union City at the interchange with TN 22 east. So between Dyersburg and Fulton, it doesn't seem like it would take much to upgrade to interstate standards. A bypass of Troy and Union City would all but do it. What I am curious about is how the TN section of I-69 will tie into the Purchase Pkwy with the complication of having the existing interchange with US 45E. This is back in 1964, but Kurumi says I-155 construction didn't begin until the early 1970s. ^ It appeared that the overpasses along US 51 northeast of US 412 were built around the same time as those along I-155. US 412 is a full freeway around the east side of Dyersburg from TN 104 north to I-155. It is also interesting to me that there are To I-40 signs along US 51 and I-155 going in either direction around the US 412 east interchange. I wonder how long it will be before one actually appears in the field? ^ I would be very surprised to see that in the field. Still, we can hope. if Tennessee DOT doesn't make one appear in the field, someone else will. That Schorer guy looks a lot like Kentucky's governor. My first thought upon seeing that picture was, "WTF is that idiot doing holding a state-named shield from Tennessee when we don't even have them in Kentucky?" The Future I-69 construction in Union City runs North and west of the current bypass...it is also just north of the giant Goodyear Plant you may have seen. I went through there with Billy a year ago, when construction was just beginning. As part of its analysis, the June 2011 Southern Gateway Purpose and Need and Study Area Package (http://www.southerngatewayproject.com/library/CP-1%20Package%20with%20Agency%20Lts%20and%20Responses.pdf) has information regarding anticipated freeway construction in Memphis through 2030. Project #14: Construct new freeway for I-269 from I-69 to US 51 (2030). I was a little surprised that construction of the final segment of I-269 is scheduled so far in the future; however, I guess it does make sense to have construction of the I-69/I-269 interchange be the final piece of the I-69 Corridor puzzle in the Memphis area. The above information can be found at Figure 8: Planned and Programmed Freeway Capacity Projects (page 26 of document; page 30/112 of pdf), and Table 6: Active Projects Along Major Facilities in the Study Area (page 42 of document; page 46/112 of pdf). And because you can trace Bing for OSM, here's the new alignment in OSM. A map of the proposed highway transportation projects is on page 8-37 of the document and page 39/53 of the pdf, and the page describing the I-69 projects is on page 8-13 of the document and page 15/53 of the pdf. 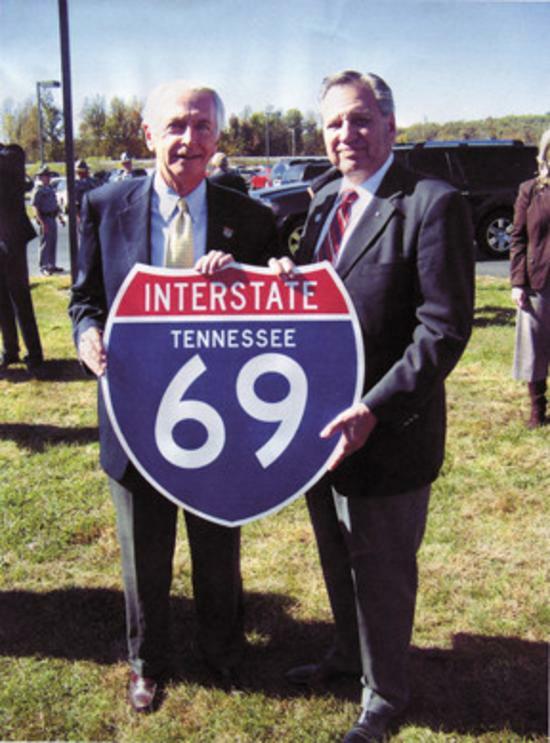 New terrain I-69 from TN 300 to TN 385 is 12.83 miles in length and is projected to cost $99,031,574. New terrain I-69 from east (should that be west?) of US 51 near Millington to the Tipton County line is 4.80 miles in length and projected to cost $37,058,429. The new terrain I-269 section is included on the map as a 2020 project and I assume it is included in TN 300 to TN 385 I-69 project (which seems to be the case in this TDOT map: http://www.tdot.state.tn.us/i69/segment9/maps/segment_map.pdf). I recently received an email update from Steve Chipman, Project Manager responsible for SIU 8, regarding progress on the SIU 8 FEIS. The LRTP project that includes the I-69/I-269 interchange and the portion of the new highway from US-51 to the interchange is project ID 158: “I-69, East of US-51 near Millington to the Tipton County line.” It appears that the ID label isn’t showing on the map on page 8-37 in the draft LRTP. This portion of the I-69/I-269 project will connect with the existing SR-385 at US-51 and extend northwest/north to the Tipton County line, with a system interchange (no access to surface streets) where project ID 157: “I-69, SR-300 to SR-385,” ties in.